UN Watch debunks State Dept. figures that tried to justify Obama's legitimization of the hostile UNHRC. The US State Department was caught lying by UN Watch, as it attempted to minimize the UN Human Rights Council's (UNHRC) hostile anti-Israel bias in a justification of US President Barack Obama's support for the international body. UNHRC was founded in 2006, and in response to its bias former US President George W. Bush withdrew from the body to cut its legitimacy. But in 2009, Obama rejoined it, with then-Secretary of State Hillary Clinton defending the move by saying the US could "make a difference by working with (the UNHRC) on the inside rather than standing on the outside merely as a critic." This week, Capitol Hill held a hearing on the UNHRC to examine how it has functioned in its first ten years, and the State Department tried to justify Obama's decision in 2009 by portraying the body as having become less anti-Israel due to US participation, reports Washington Free Beacon on Thursday. At the hearing, Erin Barclay of the State Department acknowledged that the UNHRC is still an "imperfect body" with a "strong bias against Israel," but she testified to Congress that its singling out of Israel has gone down since the US joined in 2009. "Prior to our joining the HRC, over one-half of all country-specific resolutions the council adopted concerned Israel. Today, about one-fifth of the HRC’s country resolutions deal with the Palestinian territories," claimed Barclay. However, her assertion was debunked by UN Watch executive director Hillel Neuer, who spoke after her and said her figures were wrong according to the research of his watchdog organization. 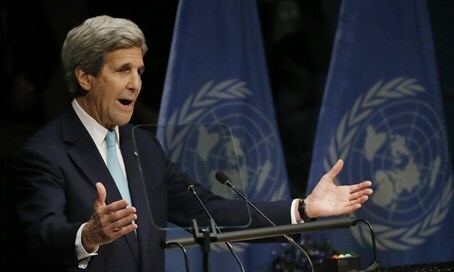 "We heard the number in the first panel that one-fifth of the resolutions deal with Israel. These are entirely inconsistent with the numbers that we count quite scrupulously," said Neuer. "The State Department seems to be counting all country resolutions and that is not a meaningful metric. When we count we look at condemnations - how many condemnations of Israel versus condemnations of other countries." He explained that many country resolutions are merely empty praise for some of the worst dictatorships and human rights abusers in the world, and therefore only an analysis of the condemnations gives a clear appraisal of how much of the UNHRC's focus is against Israel. "There are country resolutions that entirely praise those countries. For example, there was a resolution on Sudan that ‘welcomed the commitment of the government of Sudan to protect and promote human rights in the country,'" said Neuer, noting the repressive African regime. “It is not meaningful to count all country resolutions - especially ones that praise dictatorships,” he emphasized. According to UN Watch's estimate, the UNHRC has made more condemnations of the Jewish state than it has for all other countries in the world combined. While Neuer said he supports the American decision to engage the UN body to try and fix it, he warned that the effort could easily backfire if the US whitewashes the organization. "UN Watch supports robust engagement to try and make the council work, but at the same time we think that it’s important that the US not find itself in a position that it becomes an apologist for the council’s worst abuses. We appreciate engagement - we support it - but it should not be at the expense of critical engagement."